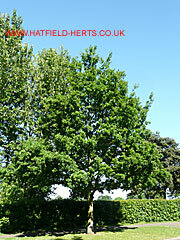 This section contains more photographic images of Oak (Quercus) trees in Hatfield, and the surrounding countryside. 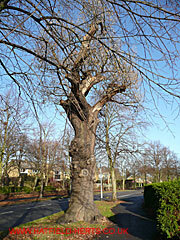 Oak, Briars Lane – one of the trio at the Briars Lane and Cedar Road junction, minus its leaves but still a handsome specimen. 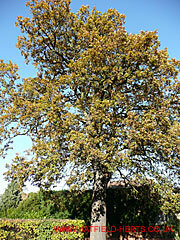 Oak, Woods Avenue – still with many green leaves. 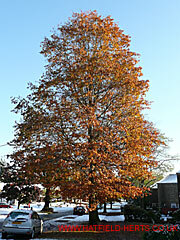 Caught out by an early snow storm – many of its leaves are still green. 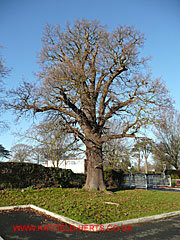 Oak, open space opposite Market Place – one of a number of specimens growing near Goldings House (Queensway House visible in the background). 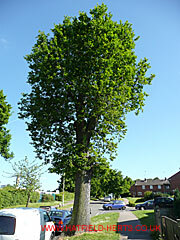 Oak, Briars Lane – one of a number of young Oaks growing on Briars Lane. 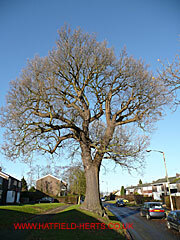 Oak, Briars Lane – one of many specimens on this road. 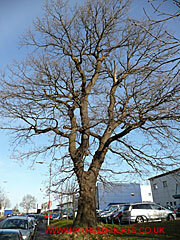 Oak, Briars Lane – another specimen on this road (growing opposite the one above). 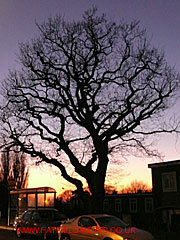 Oak, between Woods Avenue and The Pastures – seen from The Pastures. 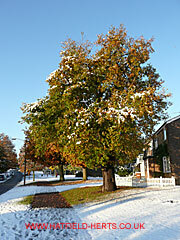 The unexpected early snow in October 2008 caught out most deciduous trees. 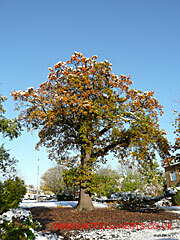 The combined weight of snow and leaves caused a number to lose branches (some snapped branches are just visible in the shadow on the right). 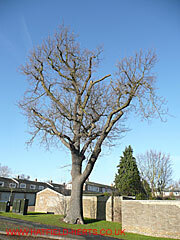 Oak, Woods Avenue – often it's only after the leaves have been shed is it possible to see how much some Oaks have been cut back (most of the smaller twigs and branches visible belong to neighbouring Lime trees). 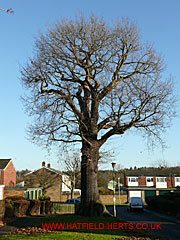 Oak, Woods Avenue – seen here with a mature canopy of leaves (but caught out by a freak snow storm). 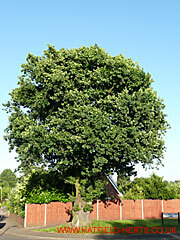 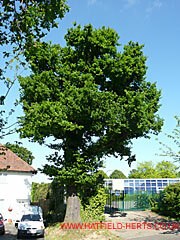 Its tall, slender shape suggests that this is a species like Red Oak (Quercus borealis). 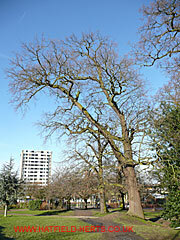 Oak, Woods Avenue – seen here from the car park.